These masks are fun and creepy. I don’t get why these are, “Fun for the Christmas Party”. 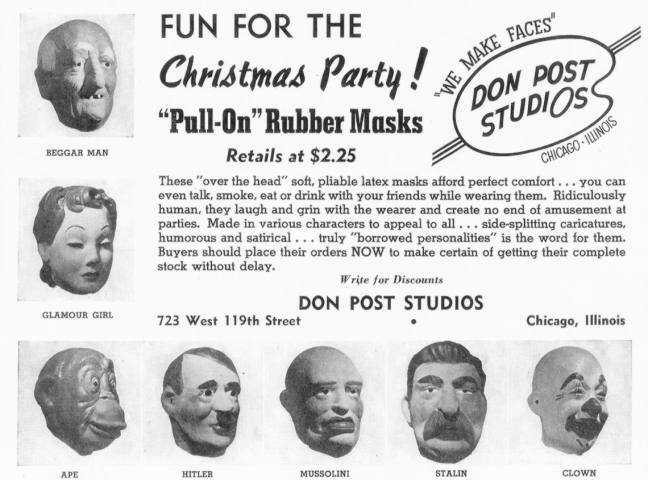 Who goes to a Christmas party wearing a creepy latex mask? The fact that you can smoke in them is a huge plus! Your posts are never dull! I agree with Michele — who would wear a mask to a Christmas party? These are strange masks for sure. Do you know when this ad appeared? Maybe the 1940s? Not sure which is creepier, the clown or your choice of the top 3 dictators of the day? Nothing says Christmas love like Hitler, Stalin or Mussolini right? This is a wierd one for sure! Oh, yeah, I should define “he” in this comment. He is our assistant pastor. Here’s a story: When our church hosted a retirement party on Sunday, he was given a paper mask of Martin Luther. He wore it for awhile. Hilarious, especially for a pastor who is always quite serious.